The 2008 General Elections signaled the end of the one-party state, which had been Malaysia for 50 years. Widespread discontent and unhappiness against the BN government caused a tsunami to sweep through the political landscape of the country, and the BN lost control of 4 states in Peninsula Malaysia. That political tsunami brought a realization that change can happen in Malaysia, if the people want it badly enough. The tsunami of 2008 and the hope that it brought, was instrumental in my decision to join PKR, because I want the same change for Sarawak. 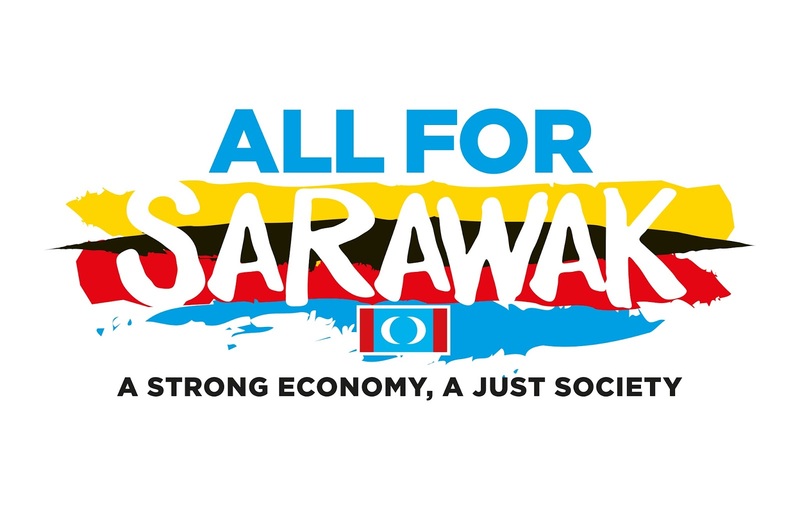 Since 2008, PKR and opposition coalition has given special attention to Sarawak and Sabah, in recognition of the inequality of treatment given to us by the BN government compared to Peninsula Malaysia. In particular, the Kuching Declaration signed on 16 September 2012 set out Pakatan Rakyat’s promises for Sarawak and Sabah, should we be given a chance to govern. The recent series of scandals unfolding in Malaysia involving the government and government-linked agencies such as the 1MDB scandal has outraged the people of Malaysia. The removal of the Attorney General, the deputy Prime Minister, the head of the Special Branch and 4 members of the PAC investigating the 1MDB by the Prime Minister raises suspicion about his involvement in the suspected misappropriation of funds in that case. That is just one of the many financial scandals that have brought this country into an economic downturn, and many of our people are finding it harder to make ends meet. The imposition of GST is just about the straw that breaks the camel’s back. PKR Sarawak understands the people’s frustrations and their anger against the BN government. The ministers, deputy ministers and elected representatives from BN have grown complacent and lost touch with the ordinary citizen. Many of them are accused of enriching themselves and their families instead of fulfilling their duties to the people of this country. We believe that this country can be so much better for the people if our resources are managed prudently, all the leakages are stopped and our policies be fair to all citizens regardless of race or religion. Looking towards the imminent Sarawak elections, today PKR Sarawak is launching our 18-point RoadMap focusing on Sarawak. 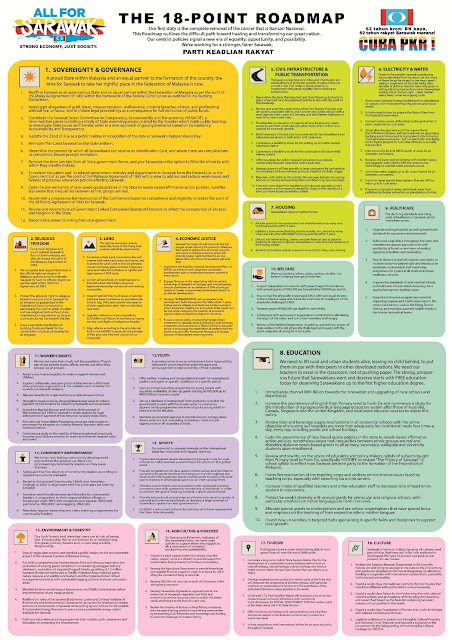 The purpose of this Roadmap is to address the specific areas that need attention after decades of BN rule. The weaknesses and failure of the government is clear to see if one travels the length and breath of Sarawak. Poverty, lack of basic amenities, poor education and healthcare facilities, inadequate infrastructure and roads, deforestation etc have kept Sarawak as one of the poorest ‘states’ of Malaysia for 52 years, while certain politicians and cronies benefitted from the riches of our lands. The need for change is evident and our Roadmap offers Sarawakians the way forward. The current system is broken and we have a solution to fix it. Some of you may say that the new Chief Minister is saying the right things and that we should give him a chance. I agree that he is saying the right things. However, he still belongs to a party that is part of the BN government, and many of our problems stem from the policies of the BN government and the behaviour of the BN politicians. Also, notwithstanding the Chief Minister’s high rating to date, he has little power over education, infrastructure and the economy in Sarawak. The Chief Minister may be saying the right things, but we do not hear his ministers echoing him. Alone he cannot bring the change that Sarawak needs, and we are not confident that the other BN politicians are willing to change their mindsets and priorities to fall in line with him. I urge all Sarawakians to study our Roadmap and to share our vision for Sarawak. It is up to us now to speak up for all Malaysians and to send a message to the government of Malaysia that they have failed abysmally in running this country. UMNO and BN have managed to hold on to power because of the support of Sarawakians and Sabahans. Because of us, they have been allowed to bring this country into disrepute and ridicule by their self-serving and shameful schemes. It is an 18-Point Roadmap to reflect our struggle to have the original 18-Point Agreement of 1963 honoured by the government. The plans and proposals when implemented will set the course for Sarawak to be on par with the rest of Peninsula Malaysia in terms of economic and social development. While it seeks to strengthen our economy, it also insists that we live in a fair and just society. Most significantly, it recognises the secular nature of Sarawak in that we do not have any official religion and acknowledges our autonomous state. In addition, it will give us greater control over education and health, expedite the Borneonisation process and ensure that qualified and eligible Sarawakians head all Federal Departments in Sarawak, affirm and acknowledge “pemakai menua” and “pulau galau” as part of native customary rights land of the indigenous people, and as a catalyst for economic growth for rural Sarawak, good roads shall be built to link the hinterland with all the main towns. These are but some of the areas emphasized in this 18PRM. Let me also make this clear – this 18 Point Roadmap belongs to ALL SARAWAKIANS. We in Keadilan will work with any other parties on the basis of these 18 Points which will be our collective roadmap and direction for a new Sarawak. The next elections will be the perfect opportunity for us to bring another political tsunami to Malaysia by bringing a change to Sarawak. Keadilan gives you a sign-posted Roadmap that will take Sarawak to new heights. We have the wealth, and we have the people. Let us rise to the occasion and show that we are Sarawakians ready and willing to fight for a better Sarawak, for ourselves, our children and the generations to come. Pls post this 18 points one by one for easy understanding and acceptance.